Fatima Zahra Beraich, an Engineer and Doctor of State in Industrial Processes and Environment of the Hassan First University of Settat, has founded “BIODOME DU MAROC.SARL”, specialized in the construction of biogas and composting facilities. Fatima Zahra was the beneficiary of the financial grant for the solar cluster program Switch Med in 2015. She succeeded to be the finalist winner at the International Francophone Forum organized by the The International Organization of La Francophonie (OIF). 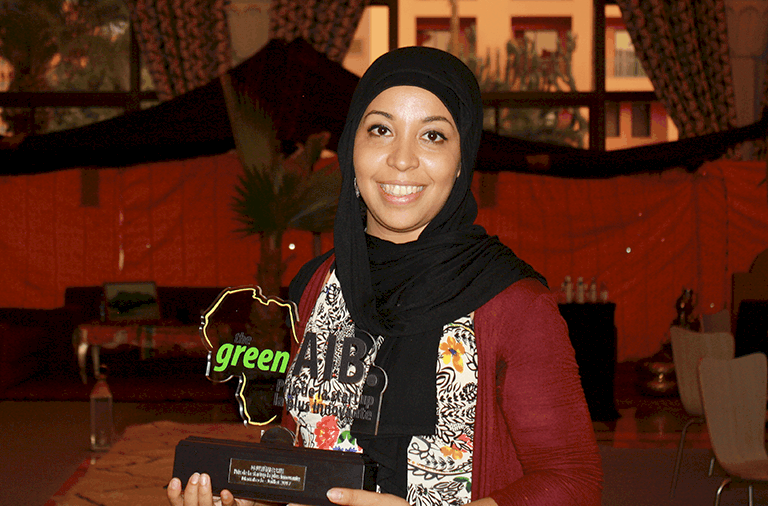 Fatima Zahra was awarded the best prize of Woman entrepreneur at the COP22, during the Global Clean Technology Innovation Program (GCIP) Maroc 2016 . In 2018, the prime minister of morocco in the annual competition “Tamayuz” entitled her the best woman entrepreneur of the year, and she managed to win several other nominations in the international events that she has participated. Fatima Zahra Beraich has developed an optimized biogas production system using agricultural wastes. The target customers are farmers having a small “cheptel” (5 minimum). To achieve this, she optimized the technology of fermentation to improve its efficiency and reliability. This optimization is implemented according to 3 main directions: selection of a bacterial mix dedicated to fermentation, development of an electronic controller, and improvement of the gas production process.